The Cape League playoffs opened up in dramatic fashion at Coady Field Tuesday afternoon. The visiting Kettleers took an early lead, but managed to squander several opportunities allowing Bourne to eventually claim the crucial first game that ended in a score of 3-1. The game featured star pitcher Brad Lincoln for Bourne who matched up against Cotuit’s Nathan Culp. Cotuit got to Lincoln early with a double by Sean Gaston in the second inning who eventually scored after and infield hit by Devin Thomas and an RBI single by Shane Jordan. 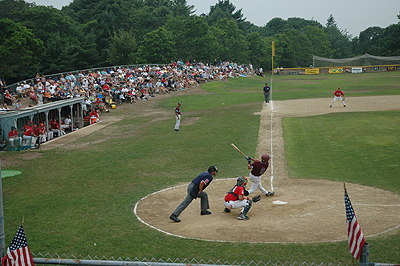 The Kettleers had a chance to open things up but an unsuccessful bunt attempt and a double play allowed Lincoln to escape. Cotuit had base runners through the first five innings but were unable to take control of the ball game. The Kettleers had their second serious threat in the fifth inning. Brad Boyer singled to right field which was followed up by a Todd Davison walk. With two on and no out, Coach Mike Roberts stuck to his aggressive small ball style and gave the sign for a bunt. Unfortunately Julio Borbon popped out to Lincoln. Lincoln proceeded to squash the threat by striking out Rodrigo Lopez and Sean Gaston to retire the side. The Kettleers have been an aggressive team all season and coach Roberts was not afraid to stick with this style of play. Bunting has allowed Cotuit to manufacture several runs this season and the Kettleers will live and die with this strategy as they face elimination tomorrow at Lowell Park. Although Brad Lincoln seemed to steal most of the attention between the two starters, Nathan Culp pitched a tremendous game for the Kettleers. Culp allowed 1 run through five innings with six strikeouts. In the sixth inning Bourne’s bats finally sent Culp home early as he was unable to get out of a jam that allowed the lead run to score, giving Bourne a 2-1 lead. Daniel Moscos came in and closed out the inning in two pitches, keeping Cotuit close. The Braves struck again in the eighth after a couple of breaks went their way. Mike Hernandez reached first on what seemed to be a sure out but the flip from the first basemen was thrown a little behind Moscos. Cotuit was able to get out of the inning allowing only one run. Nick Manganaro came in the seventh inning for Bourne, shutting down Cotuit by pitching two solid innings. Romas Hicks recorded the save and pitched lights out leaving no doubt that Cotuit would have to win back to back games in order to take the west. Brad Lincolns’ line read six innings pitched, seven hits allowed, five strikeouts and one run allowed. Brad admitted he didn’t have his best stuff, but battled through to pitch a respectable six innings of work to record the win. Manager Harvey Shapiro agreed, Lincoln struggled but the bottom line is the Braves got the first win under their belt.